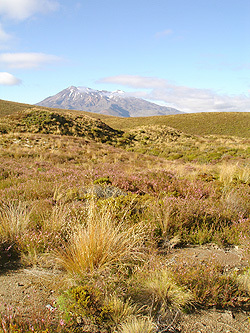 Tongariro National Park – situated at the heart of the Ruapehu District – is not only special to the people of New Zealand, it is also unique in the world. It is recognised by UNESCO (United Nations Educational, Scientific and Cultural Organisation) as a Dual World Heritage Site. The National Park was given World Heritage status in 1990, as a natural site of outstanding universal value. It was listed because of its unique, active volcanic attributes and also for its special cultural significance. The area is of huge cultural importance to Te Heu Heu Tukino’s people, Ngati Tuwharetoa. They gifted the mountain peaks to the Nation of New Zealand in 1887, so ownership of the land would not be broken up. The story of the gifting gives precious insight in the relationship that the Maori people have developed for their land. Amidst conflicting land claims by neighbouring Maori tribes and intrusion by European settlers, the aim was to protect these ‘most feared and revered of all the sacred mountains of the Maori’ from subdivision and sale. It is now the property of all the people of New Zealand, in memory of Te Heu Heu and his tribe.